This Universal Education technology suite connect the world’s best teachers with motivated students and professionals to maximize their learning outcomes. Content: We utilize high-quality education content from world-class publishers. Curriculum Standardization: An internal Research and Development team creates lesson plans allowing students to have a seamless study process with guided progression. Diverse Technology: An online platform that can be accessed from a phone, tablet, laptop or computer. Local and International Teachers: Local teachers cooperate with International teachers focusing on each of their strengths, both test-taking strategy and fundamental understanding of the material. Faculty advantage: 500+ certified U.S. and U.K. teachers. Admissions advantage: Having the students take classes in real time and with a real teacher gives us an opportunity to provide universities and high schools with students’ authentic classroom performance instead of just a snapshot of a standardized test score. Geographic coverage: Our technology allows us to teach students all over the world. We help you with the steps to academic success! Universal Education is a full-service company that can offer everything students need to to be successful. Our products include accredited K12 courses, University Courses, standardized tests preparation, admissions services, and extracurricular programs. Students are able to start at any part of the process depending on what their needs and goals are long-term. The Universal Education Study Process combines a diverse set of tools that help students maximize their learning experience. Professional evaluations allow students to know exactly what their level is and what courses should be taken. 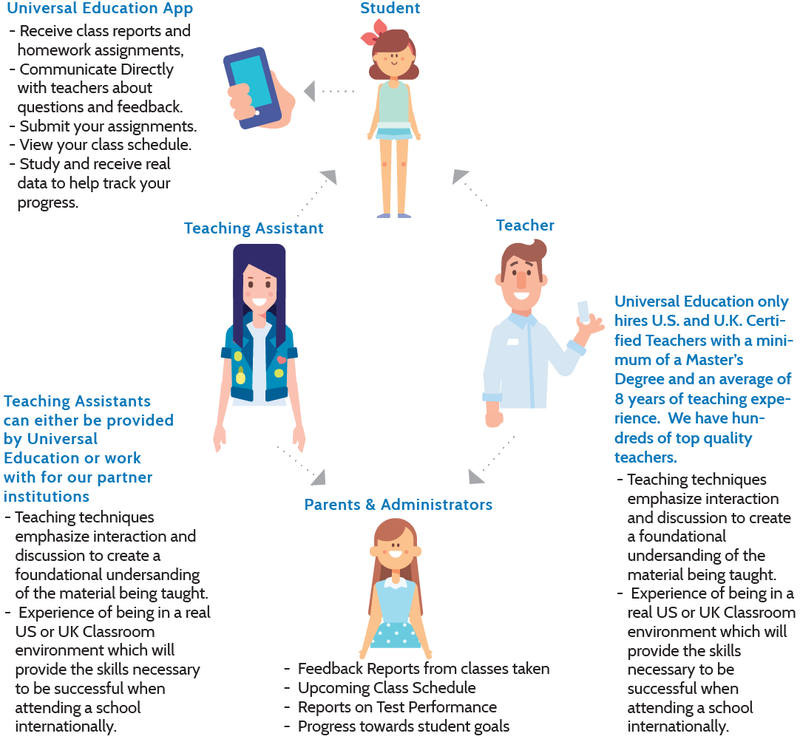 Throughout their study, students utilize curriculum developed by the Universal Education research and development team. This team is made up of international and U.S. teachers to provide high-quality content that is localized for each country. Our blended learning method includes online and offline study options. Students can study at a training center with a local tutor and take online classes with an American teacher. Students can study in our immersive online classroom, which provides an interactive learning experience, just like they are there in person with the teacher. Our highly trained teaching assistants help to guide students through the study process. They provide support, help with homework, and organize class schedules and materials. We always provide feedback, so students understand their strengths and weaknesses and learn how to improve. Universal Education delivers our education services through our in-house-developed technology products. This platform offers a live interactive environment with audio, video and a white board, just like a real classroom. Our platform was developed in Silicon Valley by a team of technology and education experts. Students can take a placement test which is reviewed and fully scored by the teacher. This helps to determine a student's starting level and the course they should take. Personalized homework review and customized lesson plans. The curriculum students are taught in our Class App has been created in conjunction with a Stanford Professor, an expert in the study of linguistics. Students that take our classes receive the real experience of studying U.S. cirriculum with U.S. teachers. Professional evaluations on test questions include scores, annotations, comments, and suggestions on improvement. Such a detailed feedback allows us to continuously check on student's progress and update their study plan to provide the best path forward. We have a question bank with thousands of high-quality questions for students to study. Students are able to study at their own pace anytime, anywhere. Lessons learned in class are reinforced with feedback from teachers while studying independently. Universal Education organizes their classes in a way that will make all of our students successful. Below describes the different elements that equip a student to maximize their learning. Parents and Administrators are continuously informed with our feedback reports, updating them on each step of student progress. Successful applications start with understanding students’ needs and the options available to them. During this early stage of the process, our expert counseling staff works intensively with students to understand what they want and how to get them there. Every student has unique academic and career goals, and Universal Education navigates the multitude of educational options available with students to achieve superior outcomes. At this stage, Universal Education helps students to craft applications that stand out. In addition to Universal Education’s tutoring, test prep, and course services that complement students’ applications, we also refine their interviewing ability and essay writing. Our mock admissions panels, resume optimization, and soft skill enhancement services further augment the academic strengths in students’ applications. Applying to schools can be a confusing process for students. With Universal Education, students submit one application to apply to multiple schools and we ensure that all of the accompanying documents are completed correctly and on time. As students receive offers of admission and scholarships, we support them by evaluating what the best options are. The admissions process doesn’t end with an offer of admission and neither does our work with students. Universal Education continues to navigate the enrollment process with students to guarantee that forms related to important next steps—housing, insurance, orientation, travel plans, and more—are submitted accurately. Even after students arrive on campus, Universal Education remains in touch to ensure a smooth transition.